A memorable getaway awaits you at this 1-bedroom, 1-bathroom vacation rental apartment inside ‘The Smithonia By The Sea Vacation Rentals and Events Home,’ a large home nestled beside the Core Sound and Outer Banks of Marshallberg. With spacious decks, a fully equipped kitchen, and splendid water views, this lovely home ensures a relaxing stay! Tranquility greets you as you wind up the driveway, past the white picket fence and beautiful trees, and up to the large 4,000 square foot home. Built in 1905 and restored in 2009-2010, the artfully decorated ‘Smithonia By The Sea Vacation Rentals and Events House' has 2 guest quarters to choose from, and this particular downstairs guest house boasts sleeping accommodations for up to 4 guests in 1,000 square feet of comfortable living space. The cozy living area features plush couches, a flat-screen TV, and access to the spacious outdoor deck. With beautiful views of the land leading up to the Outer Banks, the deck will quickly become your favorite place to sip your morning coffee or evening cocktail while enjoying the scenery. The chef of the group will delight in the kitchen, fully equipped with everything you need to prepare tasty recipes. Pull up a bar stool to the high dining table to enjoy your meals with your loved ones. If you prefer an al fresco dining experience, step out onto the deck for fresh air and beautiful views. Stroll out into the spacious yard until you reach the walk bridge, which leads to one of the longest private fishing piers in the water downeast. Stay by the water’s edge and fish off of the dock, shared with the other rental on the property. View nature’s wildlife in and out of the water or rent one of the kayaks to take out on the sparkling waters. When it’s time to call it a night, make your way back inside to curl up in the plush full-sized bed, which promises a peaceful slumber. This Premier Estate Home is not only situated on 2.5 acres right on the Outer Banks and Core Sound, but it is also ideally located within minutes of endless attractions! Imagine retracing Black Beard the Pirate’s footsteps, just as the National Geographic have done in film and TV documentaries. A must-see is the Maritime Museum in Historic Downtown Beaufort, a mere 20-minute drive from your ‘Smithonia By The Sea Vacation Rentals and Events’ designation. The museum is accredited for their numerous contributions in the research of local maritime and downtown Beaufort history and the Crystal Coast area. There are many local activities, sites, and tastes that you must experience while you are staying at ‘Smithonia By The Sea.’ The coastal area has some of the finest fresh caught seafood in the world, such as fresh tuna, mahi-mahi, flounder, oysters, green tailed shrimp and scallop - all available in the many five-star local seafood restaurants. As a bonus while staying at ‘Smithonia By The Sea,’ you can fish, crab, and gather oysters and clams right from the property’s dock, shared with the other rental in the house. If boating is your thing, you can visit the Cape Lookout Lighthouse or Shackleford Banks with their wild horses at your leisure, which is just a 20-minute boat ride away. You can pack a picnic lunch and spend the day exploring the Lighthouse or pick up shells on the beach, where both the sound side and oceanside is accessible for fun in the sun and surf. Bicycle and kayak rentals are also available at the property for leisurely fun and exercise while you explore and enjoy the sites. From the home, you’re also just 1 mile from the local boat ramp in Marshallberg and 3 miles to a newer multiple boat use ramp with ample parking at Harker’s Island. Outdoor activities abound on the Crystal Coast of North Carolina, including fishing, swimming, horseback riding, boating, kayaking, and surfing. Throughout the year, there are also many festivals in the area, so be sure to check your calendar to see if there’s a festival during your visit, including Downeast Seafood Festival, Black Beard Pirate Invasion, Big Rock Festival, the Decoy Festival at Harkers Island and more! - Fantastic location - Situated on 2.5 acres of Premier Estate overlooking Core Sound and the Outer Banks, and minutes from Maritime Museum in Historic Downtown Beaufort, Cape Lookout Lighthouse, Shackleford Banks, local boat ramp in Marshallberg, Harker’s Island, and endless outdoor activities! 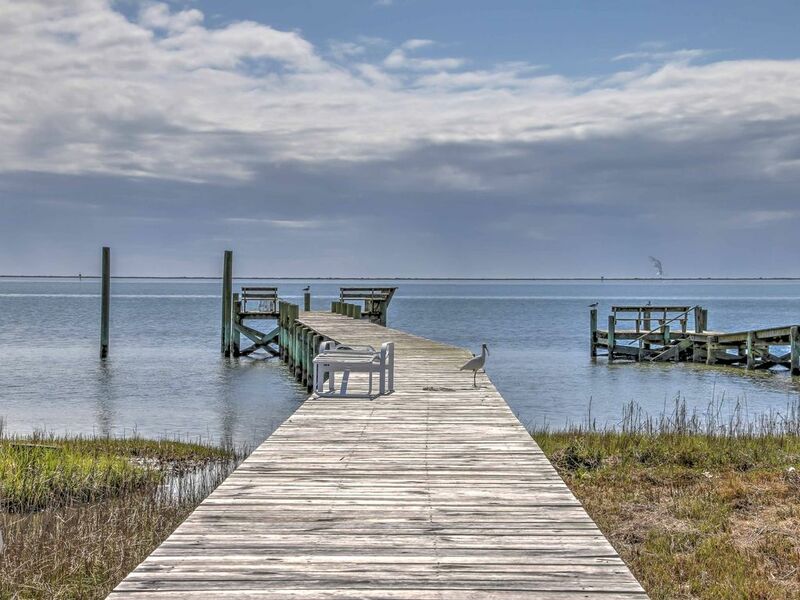 If you love water, you will love this dock overhanging the Pamlico Sound. We ended every evening there with ocean breezes. The apartment was very large, clean and well appointed with cooking supplies and even toiletries. The manager was very prompt in answering questions. Room For improvement: one full size bed although the bedroom could easily accommodate a king-size, no thermostat control in the apartment and it got warm, (we asked the vacationers upstairs in the rented home to lower the thermostat at their departure). couches need replacing as one average size human sinks low. We were very pleased with this rental. June Robinson was very helpful in answering any of our questions whenever we called. The listing was accurate regarding location and layout. The property was clean and well maintained. We would recommend this property to a friend or relative that just wants to be away from it all. Harker's Island, historic Beaufort, Shacleford Banks, and Cape Lookout are always a must visits! We loved the Marshallberg apt! The Marshallberg apt was perfect! It definitely exceeded our expectations & had everything we needed. We loved the dock that was on the property, and enjoyed it we early morning coffee and evening cocktails. It was great to drop the kayaks in the water off the dock and paddle to close by islands! The house was so cozy, comfortable, and close to local beaches and stores. Joan Robinson definitely made us feel at home, and was extremely helpful and kind. She was quick to respond to any questions we had & she made our vacation all the more better. We can’t wait to come back for another stay!! A beautiful historic home with outstanding views! We book this lovely home for a family vacation to celebrate my mothers 70th birthday and had a lovely stay. June was very responsive and helpful with all our questions. We had hoped to utilize the kayaks but the weather wasn't really well suited so we enjoyed bike rides instead. We had multiple families in the house and never felt crowed, this is a spacious, lovely, comfortable home.